Laura Osnes will return after her amazing performance during this past summer’s Pioneer Day concerts. She will be joined British actor Martin Jarvis, who will be the guest narrator. 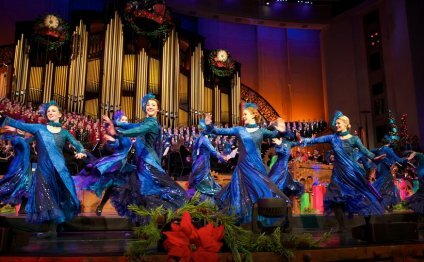 In addition, four Metropolitan Opera soloists will also join the Mormon Tabernacle Choir and Orchestra at Temple Square—adding a classical dimension to the musical repertoire. Jarvis is one of Britain’s most versatile and best-loved actors. He recently starred in The Importance of Being Earnest in London’s West End production and won a Theatre World Award for his starring role of Jeeves on Broadway. In addition to theater, his movie credits include Titanic and Wreck-It Ralph. His television credits include Stargate: Atlantis; Numb3rs; Space: Above and Beyond; Murder, She Wrote; Walker, Texas Ranger; and many more. His voiceover work includes Star Wars: The Old Republic, Spyro the Dragon, and Batman: Arkham Origins. The classical soloists for the Christmas concert are Erin Morley (soprano), Tamara Mumford (mezzo-soprano), Ben Bliss (tenor), Tyler Simpson (bass).